VAT Invoice Available on Request. HUMAX PVR-9300T FREEVIEW RECORDER 320GB. PAUSE LIVE / TWIN TUNER / HDMI. 200 Hours Recording (320GB hard disc). Single button live pause and play during A/V watching (Time shifted Recording). Fast Forward/Rewind in various speeds and Slow Motion. Instant Replay and Skip during A/V watching. One touch sound scheduling in EPG information. Digital Radio Recording/Variable instant recording. MPEG2 Digital and Fully DVB- T Compliant. Common interface for play TV. Digital Teletext (MHEG5 support) (UK only). Twin scarts (scart cable not included). Dolby digital 5.1 optical output. Subtitle supports EBU & DVB subtitle. Teletext supports by VBI insertion. Ex Display (not refurbished) product in excellent as new cosmetic condition-displayed in glass cabinet. May be supplied in original or replacement package, depends of stock level. MPEG-2 Digital and fully DVB-T compliant Digital teletext (MHEG-5). Up to 200 receivable channels. Video format in 4:3, 16:9 and letterbox. User friendly 8 day EPG. Personal video recording of up to 200 hours through 320GB HDD. Will record 50 single events. Slow motion forward and backwards in various speeds. HUMAX special tuner has just 1 signal input. Record two channels whilst watching live TV or play-back. Picture in picture to see 2 programmes on 1 screen. Freeview+ PVR with accurate recording & serial recording. 320Gb DTR (Digital Television Recorder). Twin Digital Tuner, can record 2 channels whilst viewing a third. Pause live TV and rewind live TV. One touch recording from 8 day programme guide. Tape-less record and playback (Max 200 hrs on 320GB hard drive). Dolby 5.1 optical output. Common interface slot for Pay TV (needs card and CAM). Automatic software update, to ensure the latest digital features are available. Records subtitles with the ability to view or hide them during playback. Auto-padding ensures you never miss the beginning and end of a programme. Chase play enables you to watch a programme from the beginning whilst still recording the end. NOTE: This unit only records Freeview, not SKY or cable. Some drivers will not allow you to open the item to check it, if this happens sign your name with the word "UNCHECKED" next to it as then a claim can be made if damage is found later. We guarantee these items to work on arrival as they are checked and packaged by us before listing and dispatch. If an item does prove faulty when it is received then a replacement will be sent out once we have received the item back and confirmed its faulty and confirmed the serial number and our security mark. (We must be contacted within 7 Days of you receiving the item). Please note that you will be responsible for the postal costs of returning the item. When a parcel leaves us, it leaves in perfect condition, When received if there is any damage to the parcel or packaging this would have happened whilst in transit, So please take a time to inspect your parcel before signing for it as no claims can be made if you accept a damaged parcel and don't sign for it as damaged. If you dont have time to inspect the item please sign for it as unchecked, In the unlikely event of a item being faulty, when returning to us please ensure you include the item number in with the parcel as well as a description of the fault and your return address, failure to do this will result in a delay in replacing the item..
We will not accept items back if they are not in their original packaging. All items are discreetly security marked and serials number noted to aid fraud prevention and any attempted fraud reported to the relevant authorities immediately. Any legal costs are passed on. The item "HUMAX PVR-9300T 320GB TWIN TUNER FREEVIEW SET TOP BOX RECORDER RECEIVER HDMI PVR" is in sale since Thursday, January 26, 2017. This item is in the category "Sound & Vision\DVD, Blu-ray & Home Cinema\Hard Drive (HDD) Recorders". ltd" and is located in Norwich. This item can be shipped to European Union member countries. 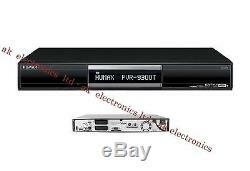 Description: The Humax PVR-9300T DVR has 320 GB hard drive capacity and can record up to 200 hours of TV programmes. You can simultaneously record your favourite programmes while watching another channel. This DVR has a built-in Freeview function that gives you access to a wide range of TV and radio channels. Also, it has several useful functions like time slip, chasing playback and one touch recording. It allows you to pause live TV, so you don't miss any part of the show. To connect it to external devices, it features HDMI and USB ports. In addition, this DVR can play files in MPEG formats.